So I am getting a Cellular Automator (CA) generator ready for this years 7DRL and hoping to create the same game in iOS and HTML5 – I am sure I am biting too much off. However, I have a basic implementation of a Dungeon generator and detailed how to create it below in X-Code using Objective-C. It’s a very simple implementation – so feel free to comment if you think we can clean the code up!!!! For this tutorial the dungeon is represented by 0’s as Rock and 1’s as Path (or moveable space). So its a pretty simple set of steps to get us going. 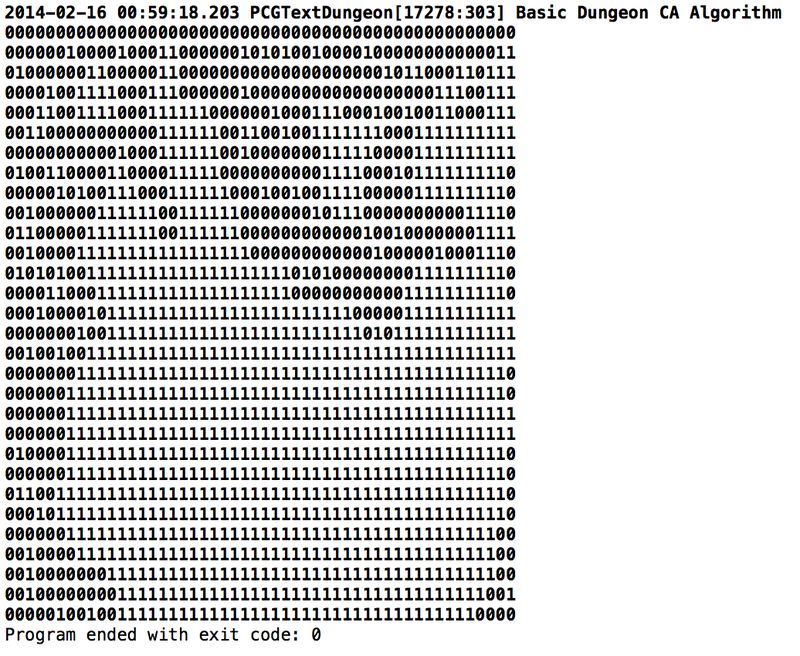 Ok so if you look at the code above in dungeon.m you should get a pretty good idea of how we are doing the generation of the dungeon using a CA algorithm. Read the comments as I have tried to explain anything a little unusual. If anything doesn’t make sense – leave a comment and I’ll get back to you.